I didn’t watch the National Championship game the other night. Mainly because I live in Tokyo where the game was not broadcast. I did check the final score, however, and watched some of the video highlights online. Once again, a big play in college football (or professional football for that matter) hinged on instant reply. This is another reason I rarely watch pro football anymore and watch only a handful of college games in any given season: instant reply. What is it about instant reply that I don’t like ? Instant reply slows down the game considerably. Some reviews drag on for as much as 5-10 minutes while the officials huddle under what looks ridiculously like a circa 1953 voting machine. It is a process that is seriously flawed, for the TV replay usually tells us immediately if a play has been called correctly or not. I have never understood why the NFL just doesn’t post an official in the press box. Instant replay also attempts to impose perfection where there can be none. Professional athletes, in spite of their skills, are not androids, and if you scrutinized the play on the field you could probably find violations of one sort or another e.g. holding, illegal formation on every play. Yet these infractions are never called usually because they occur on the line of scrimmage, away from the ball. Big games are often decided because a hold or a false start went unnoticed by the officials. Instant reply gives the false impression that the game has been decided fairly, when it most likely has not. Most importantly instant replay deprives the game of considerable lore. Ask any sports fan about a controversial play they remember well and they will probably recount several for you. What is the most controversial play of all time ? 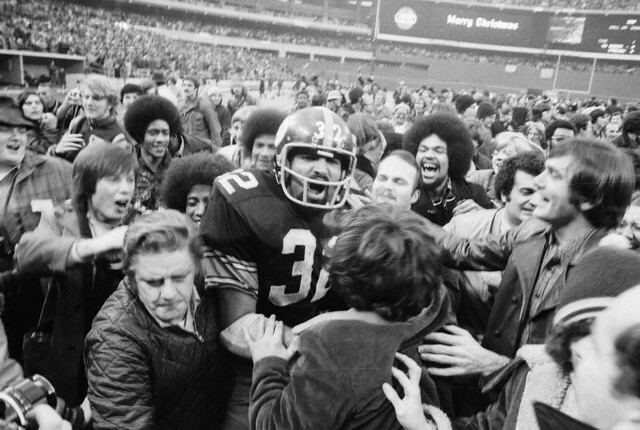 The Immaculate Reception of course. Did the ball bounce of Frenchy Fucqua or Jack Tatum ? That question is part of our fascination with the play some 39 years after the fact. And it is a question many people in Oakland and Pittsburg will ask themselves up until their last day. Thankfully instant reply was strictly for TV in 1972.